Seller will give you a gift certificate in the amount of 16,1758 RUB for a positive review of the product purchased. $20 EA GAME CARD ORIGIN US for using at ea.com and origin.com. 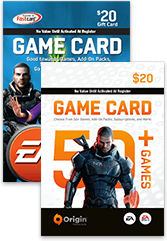 Your Cash Card can be activated to fund your EA Wallet through ea.com/1/game-cards in the United States. Once you´ve activated your Cash Card, you can check your EA Wallet balance anytime by going to Origin.com/account and clicking the Payment & Shipping Tab. Your EA Wallet balance will be available under EA Wallet. Seller will give you a gift certificate in the amount of 16,1758 RUB for a positive review of the product purchased..